One of the newest test Immigration Services in the world, the Immigration Service of the Democratic Republic of Timor-Leste (Serviço de Migração) was established in its current form in early 2003 as a Department of the Timor-Leste National Police (PNTL). In August 2008, it assumed its current name and became a separate Service in its own right within the Ministry of Defense and Security with the promulgation of the Ministry’s organic structure decree law 31/2008. The Service has over ninety three(93) staffs, and is responsible for civilian immigration control functions at all land border crossing points, airports and ports. The Service decides visas that may be granted on arrival at a border crossing, and processes applications for further visas that may be granted to people after arrival in Timor Leste in conjunction with the Consular Affairs Department of the Ministry of Foreign Affairs. The Service is also responsible for administering other functions of the Immigration and Asylum Law of 2003 (LIA), including registration of foreigners and legislated enforcement powers according to its . UNTAET Regulation No. 2000/9 established the first border regime for Timor-Leste post-1999. The resultant Service administered both Customs and Immigration. A subsequent review of this function resulted in a decision of Government to separate the Customs and Immigration functions. The result Decree Law (4/2002) published on 12 November 2002 transferred Immigration control inside the country, as well as the control of the movement of persons across the borders, to the PNTL. 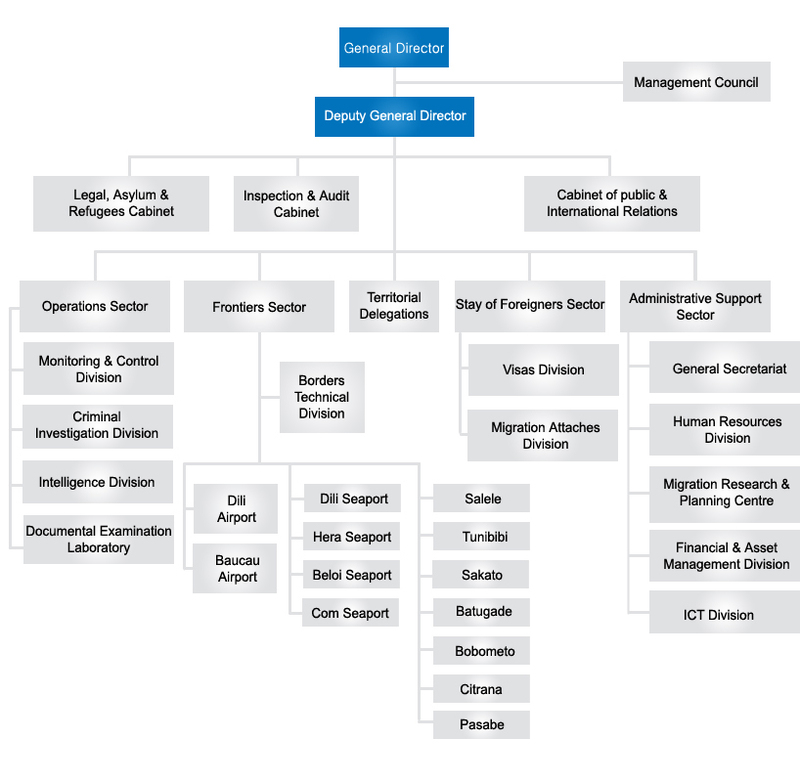 A Department of Immigration was created within the PNTL as a result. Between 13/01/2003 and 15/10/2003 immigration function was subject to a combination of 2 pieces of legislation (UNTAET Regulation 2000/9 and Decree Law 4/2002), until the promulgation of relevant statutes of the PNTL, and the Immigration and Asylum Law of 2003. On October 15th 2003, the National Parliament passed the Immigration and Asylum Law 2003 (LIA). This became the principal legislative framework to codify all immigration functions and powers. The Government of the Republic of Indonesia and Democratic Republic of Timor Leste signed an agreement of Traditional Border Crossings and Regulated Markets in Dili on 29th February 2000. Traditional Border Crossings and Regulated Markets Agreement. Parliament resolution made on the 28th May 2009. Parliament Resolution No 21/2009. The power to enforce the provisions of the Immigration and Asylum Law 2003 lies with the Timor Leste National Police (PNTL) under Article 133 of LIA. Inspection, investigation, prosecution and removal of foreigners in violation of immigration law as well as levying legislated fines including those against foreigners who have overstayed their visa.